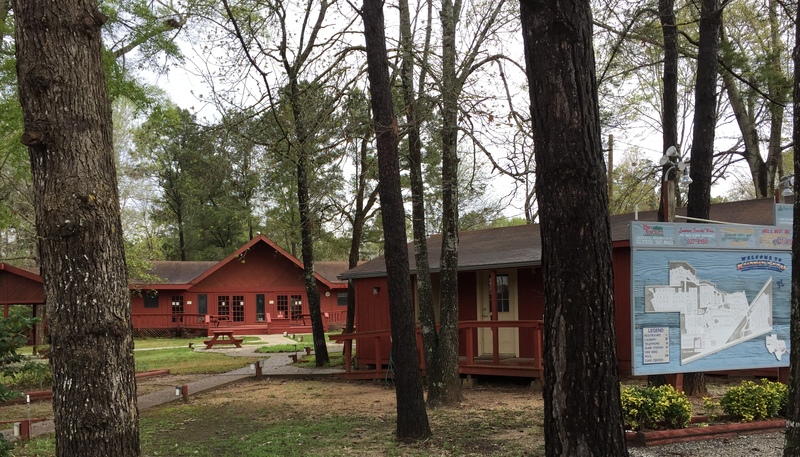 We just spent the last two nights at the Escapees RV Park in Livingston, Texas. 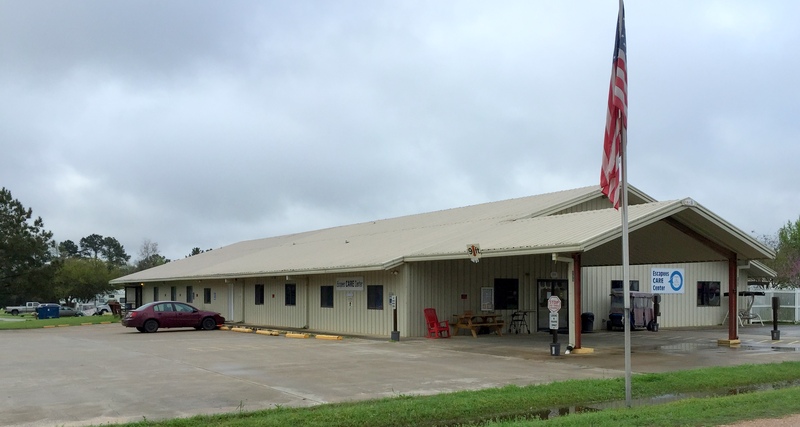 This is more than just an RV park, it is the Escapees RV Club National Headquarters. And Escapees is more than just another RV park membership, it is a total support network for all RVers. One of the benefits of membership is the Escapees Care Center. If you are injured, recovering from surgery, or getting to old to RV any more you can get assistance here in their Care Center. 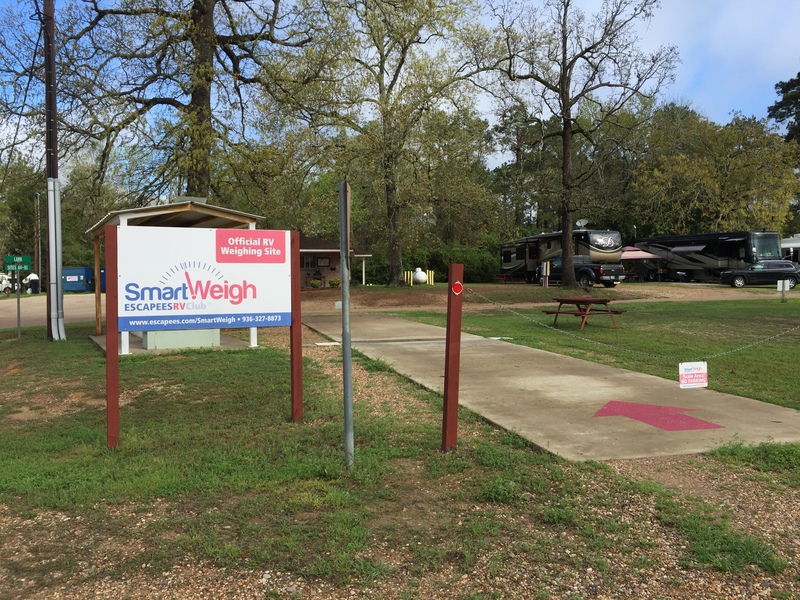 You can get your rig weighed here. A service we could have used last year when we needed to get the weight of our RV to get it registered in South Dakota. 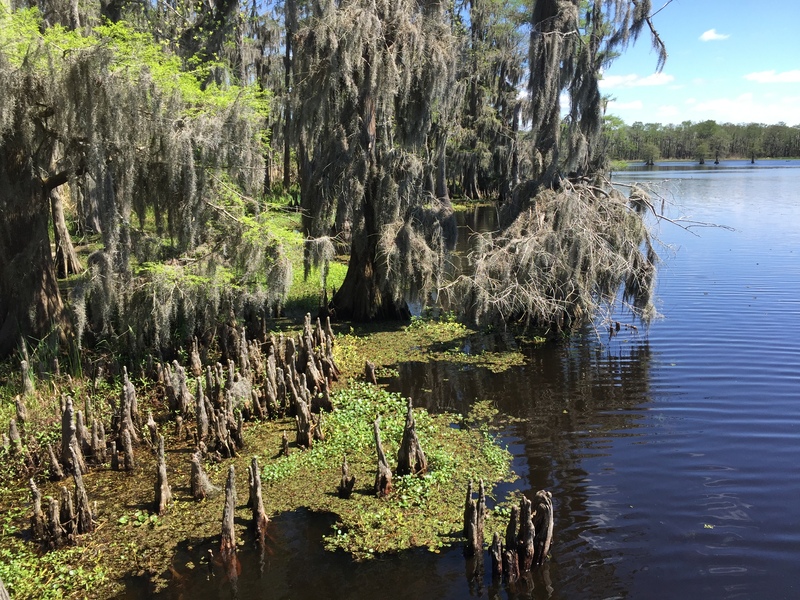 Escapees provides mail forwarding for RVers and can help you set up legal Texas residency if you no longer have a stick house. The National Headquarters offices are in this building too. 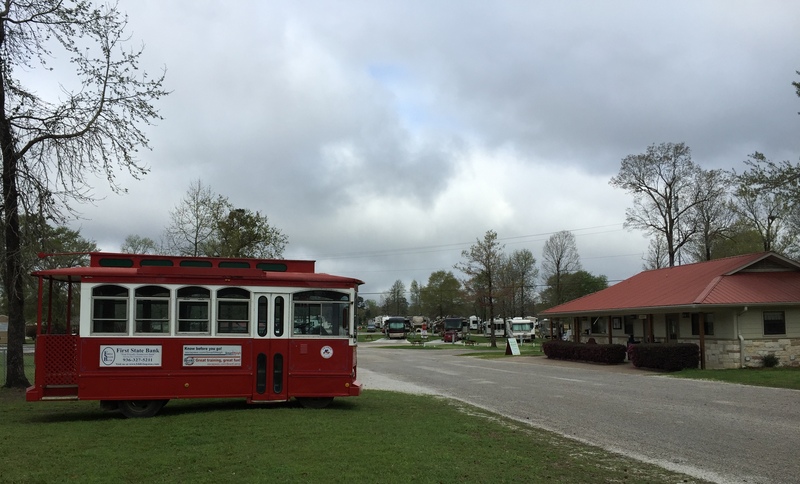 Trolley Tours of the park and the National HQ facility are offered on Tuesdays but we will have to miss it as we left early Monday morning. Texas claims that everything is bigger in Texas. I will agree that the miles do seem longer. 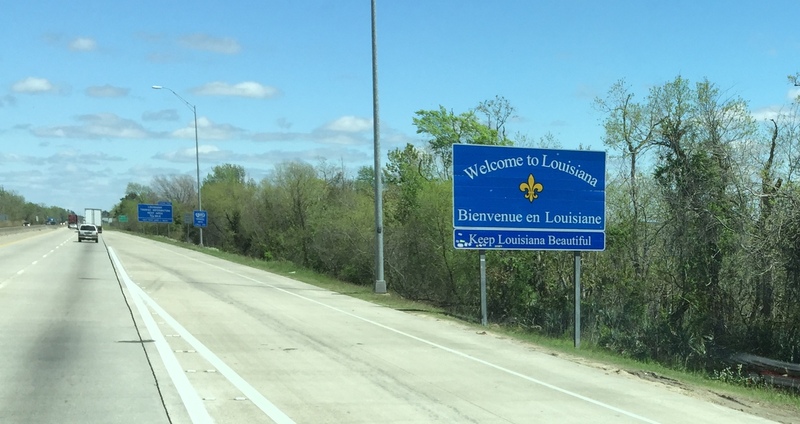 We finally made our way through all 800 to the Louisiana border! Not to badmouth Texas, it has a lot to offer, but we are just passing through this time around. What a difference a state makes! 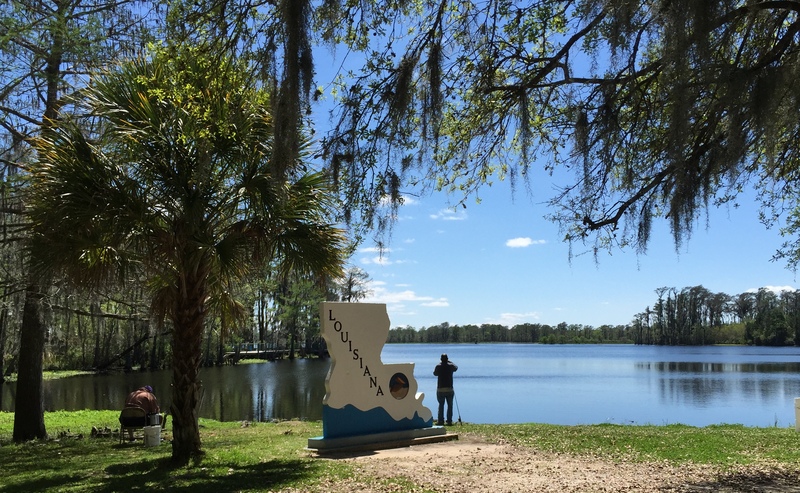 The first stop across the Louisiana state line is the Visitor Center. The caretaker was on his mower trimming the green grass, men were fishing in the pond behind the Visitor Center, travelers were making picnic lunches. It was lovely. 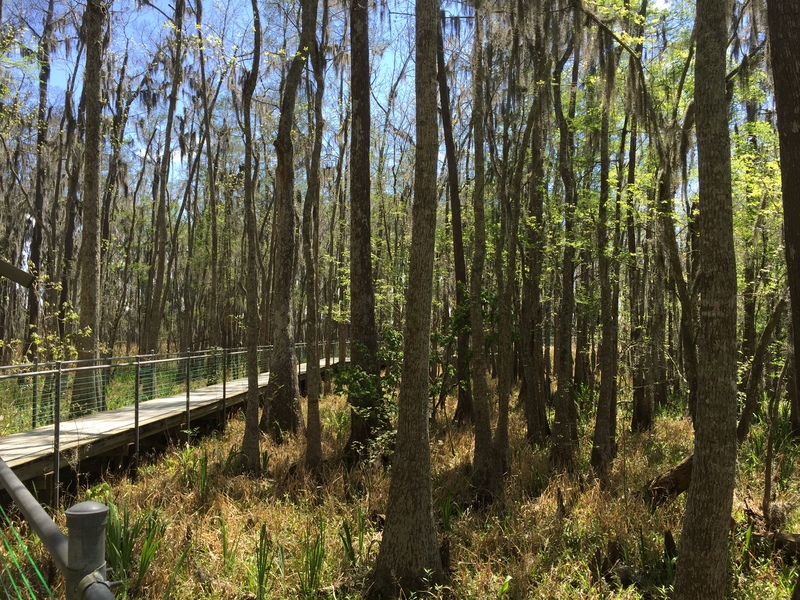 A boardwalk runs through a grove of cypress trees along one side of the fishing pond. Either all the other travelers did not see it, or did not care, we were the only ones who walked out there. Beautiful walk! 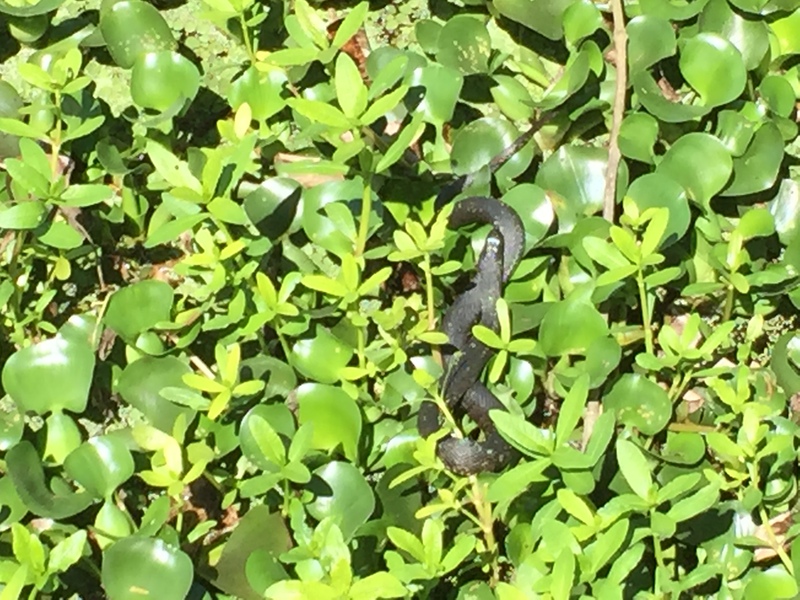 We saw three snakes! Good thing we were on the boardwalk and just looking down at them. We also saw some little lizards (geckos? ), fish, and a few wasps. 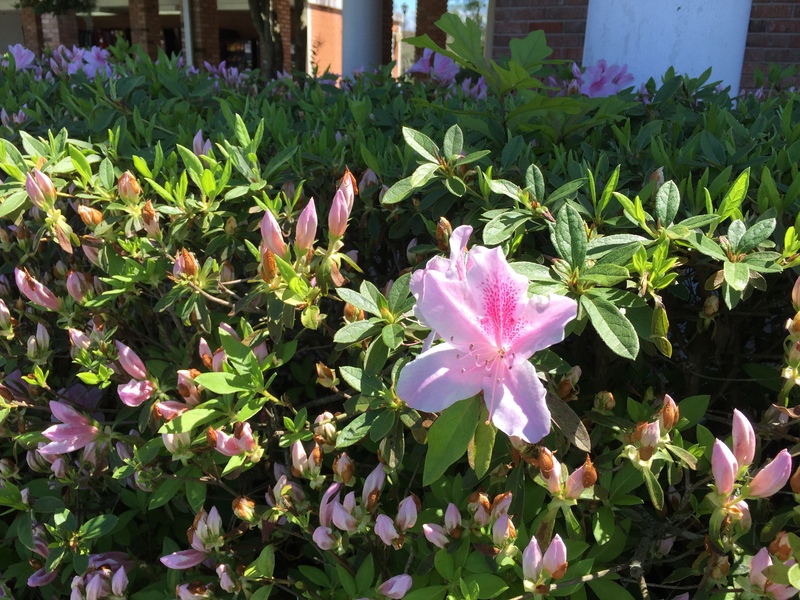 The Visitor Center was surrounded by blossoms. 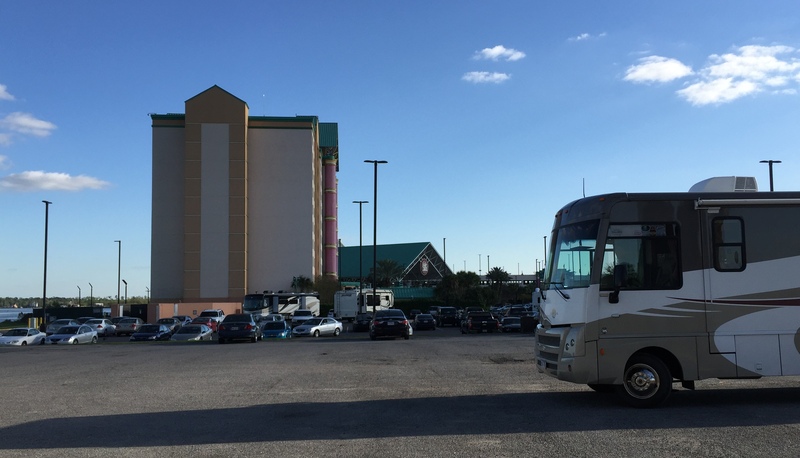 We only drove 125 miles today and will be spending the night in the parking lot at Isle of Capri Casino in Lake Charles, Louisiana. They do offer designated RV parking with electric hookups for $20/night, but we don’t need that, we can stay in the free lot. 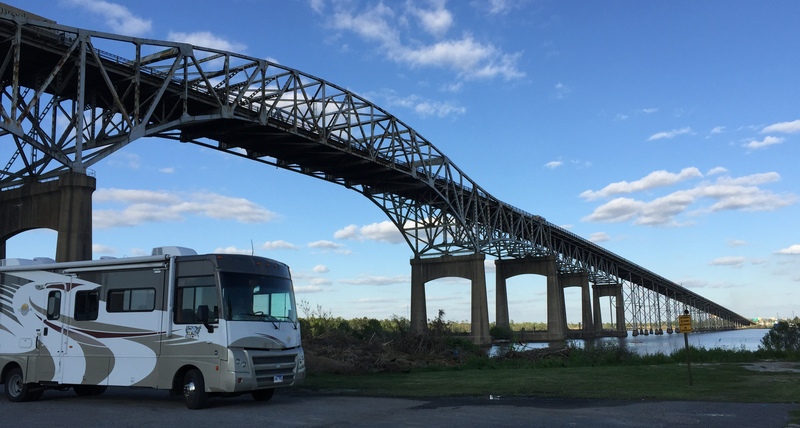 We are almost right under the Calcasieu River Bridge that takes I-10 from Lake Charles to Westlake, Louisiana. There is heavy traffic on it and it makes a lot of noise. But we’ll sleep through it. 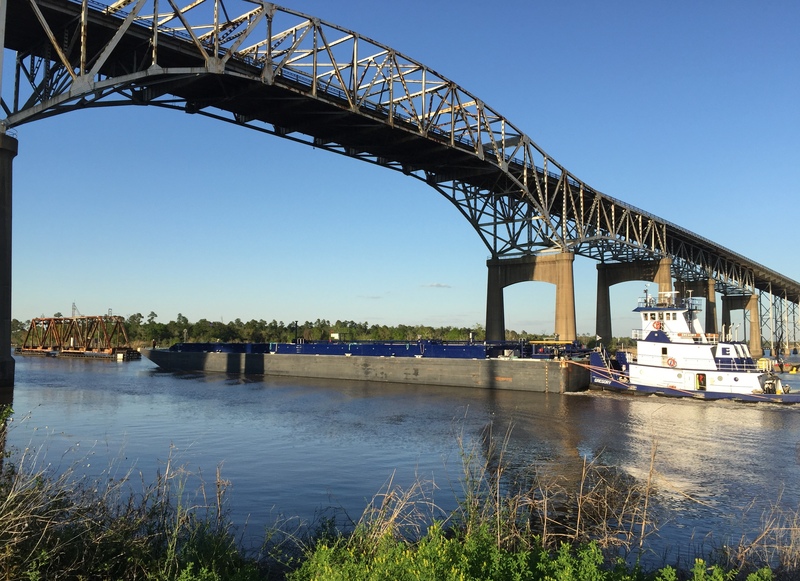 We watched as the smaller railroad pivot bridge turned to allow the blue barge to pass after it cleared the highway bridge. 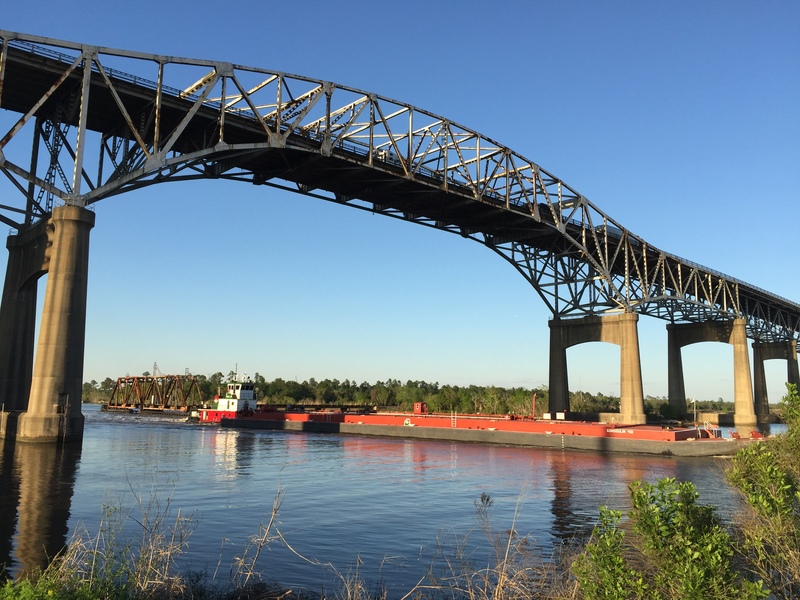 And then we watched as the red barge passed the railroad bridge and cleared the highway bridge. Then watched the railroad pivot bridge turn to its normal position. And a few minutes later a train crossed it. It may sound like everyday activity to most people around here, but to us landlocked Midwesterners it is pretty cool. This entry was posted in Daily Post, Louisiana, March and tagged Bridges, Casino, Casino RV Parking, Escapees, Isle of Capri Casino LA. Bookmark the permalink. That is quite a change from Texas- great pictures again.